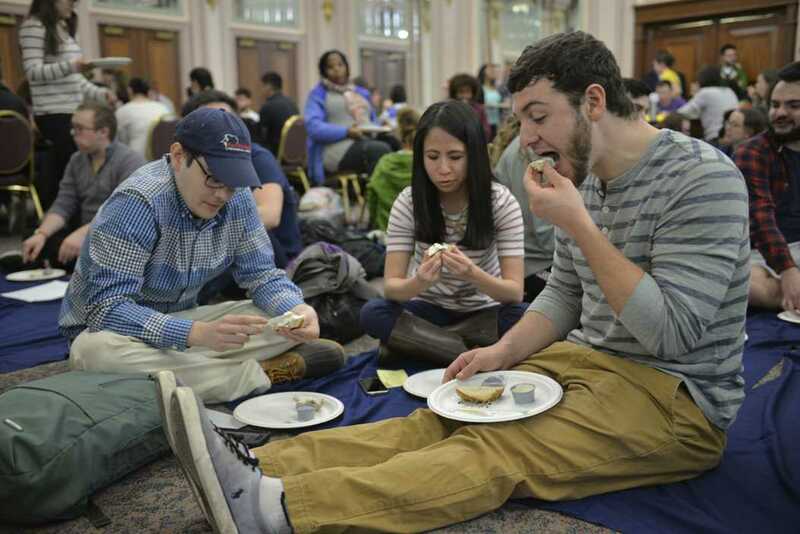 A Pitt Pantry representative pointed to an audience member in the William Pitt Union ballroom Thursday night and asked her to imagine that for the rest of night, she was no longer a Pitt student. Instead, the student would assume the fictional role of a part-time nurse with four children. Suddenly, her life partner passed away without life insurance, and her character dropped from the middle class to lower class. Nearly 100 students participated in the Pitt Pantry’s role-playing event — part of the nonprofit organization’s Hunger Simulation, which began at 6 p.m. and ended at 7:30 p.m. The pantry separated students into three groups — the lower, middle and upper class — and served each a different meal to demonstrate how class and hunger were intertwined. Speakers at the simulation also discussed food waste as well as food insecurity — the state of not having reliable access to nutritious and affordable food. Pitt Pantry coordinator Sarah Pesi helped plan the event in an effort to get Pitt students to think critically about food insecurity, an issue that affects 14.2 percent of Allegheny County residents, according to the Pitt Pantry. “We wanted to do an event to raise awareness about this issue and show what it’s like to be hungry and what food insecurity is like,” Pesi said. Allegheny County residents also face the issue of living in food deserts — areas where people must travel more than a mile to reach a grocery store. According to the Pitt Pantry, more than 47 percent of Pittsburghers live in food deserts. This leaves people without immediate access to only corner stores and restaurants for food, keeping affordable, fresh food out of reach. Oakland has two groceries within reach of campus — IGA on Forbes and Groceria Merante — but the Pitt Pantry has seen an increase in students needing its services since it opened nearly two years ago. Another Pitt Pantry member, Jacqueline Pines, volunteered at the simulation to remove any shame from the idea of needing a food pantry. “[Hunger simulations] get people out of their comfort zones, give them a new identity and let them see how hunger affects people,” Pines said. Each of the three groups represented a social class based on actual Pittsburgh statistics. The upper class constituted approximately 15 percent of the room, the middle class made up 45 percent and the lower class, 40 percent. The lower class sat on the floor, the middle class sat at long tables and the upper class sat at small circular tables. When it came time to eat, the event volunteers first brought the upper class full plates of grilled chicken, pasta and salad. The volunteers then instructed the middle class to retrieve their own bagels — which were almost all recovered from Bruegger’s Bagels — and cream cheese from the back of the room. The lower class spent the hour and a half event sitting on blankets with only half a bagel, cream cheese and water. Some students had the privilege or misfortune to move from one social class to another based on their randomly assigned identities. Pitt Pantry volunteers called out random attendees’ fictional identities, then announced their back story, which would decide their assigned class. Pitt Pantry President Brooke McEvoy began the event in the lower class but was moved to the upper class during the simulation, making her feel uneasy. Not everyone got to move up, however. First-year computer science and political science major Albert Tanjaya sat on the floor eating his small rations of food and expressed his desire to raise awareness for food insecurity. After the simulation, Sherdina Harper, coordinator of Cross Cultural and Leadership Development Programming, led a group reflection. Each class chose a representative to describe how they felt about being in their respective social groups. The lower class’ chosen speaker focused on the inferior quality of their food, the middle class’ speaker reflected on their likelihood to fall to the lower class rather than leap to the upper. The upper class’ speaker described their initial guilt, which quickly dissolved once their dinner was served. Despite the agreement among attendees that the food distribution was unfair, Harper noted, few shared their meals with those less fortunate. Still, she remained optimistic that the experience would change the perception of those who attended. “It is now in your court, and I hope you leave this experience today saying, ‘I’m going to do something,’” Harper said.